Thanksgiving is one of the few times a year when grace is said at almost every table. Grace does not have to be religious but an expression of gratitude. Expressing gratitude before a meal doesn’t have to be just for holidays. In fact, expressing gratitude is something that makes us feel better overall. It is important for our mental health. 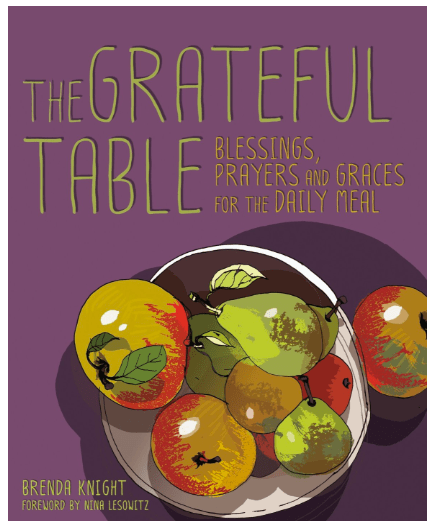 Grateful Table: Blessings, Prayers and Graces by Brenda Knight is a sweet little book full of inspirational “blessings, prayers, and graces for the daily meal”. Saying grace is one of our loveliest traditions and one that has stood the test of time for good reason – it simply feels wonderful. Whether holding hands and praying to the heavens above or waxing poetic about the bounty of food, these blessings turn any group of people into family, connected by the power of gratitude. Compiled by the editor of and collaborator on the runaway bestseller Attitudes of Gratitude, Brenda Knight has employed the practice of gratitude for years. The Grateful Table is not your grandmother’s book of graces. Filled with fresh voices and contemporary expressions, this book of blessings will make every occasion more meaningful. Expressing gratitude and thankfulness is key to an open heart. It is something I practice daily with yoga, but the tradition of giving such thanks before meals has fallen to the wayside in our culture. Grateful Table: Blessings, Prayers and Graces is a beautiful reminder and an excellent lesson for our children.